No building is complete without a door. 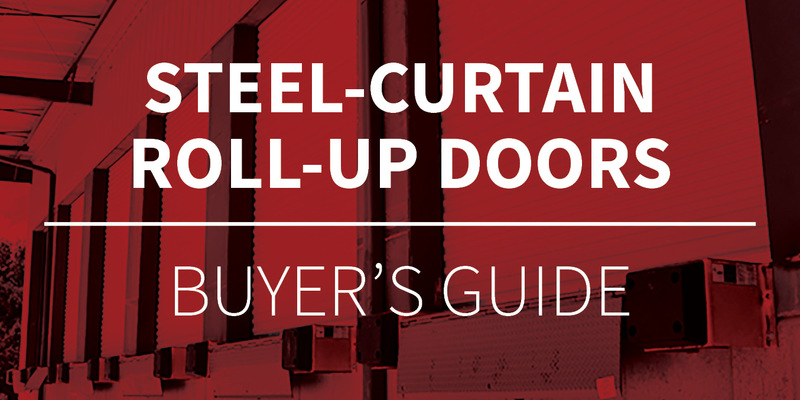 In this blog, we investigate steel-curtain roll-up doors and how they deliver form and function across a wide variety of uses. What are Steel-Curtain Roll-Up Doors? You see them everywhere. They’re used at your local schools, recreation and retail centers, and government, medical and office buildings. They provide access and security for storage units whether applied in backyard sheds, residential garages or commercial storage facilities. And, they are also an integral part of agricultural structures, transit stations, freight buildings and warehouses. Made of a curtain (sheet) of durable, secure steel and designed to provide quick, easy access to both commercial and residential buildings, these doors open by traveling vertically, but gather into a roll at the top of the door instead of sliding along tracks. And while they can be used in a myriad of applications, with so many door options available in the marketplace today, why are so many people opting for steel curtain roll-up doors? Roll-up doors made of steel are generally less expense to purchase initially and they save money over the course of their lifespan. Not only do they last longer, but they also require fewer, less expensive repairs and are more durable than wood, aluminum or fiberglass products—particularly in challenging environments. In addition, steel is more energy-efficient, saving on heating and electricity costs throughout the year. Exterior doors are inherently the most vulnerable points of many buildings, so reducing the likelihood of theft, fire, vandalism and contamination is the best way to keep your property secure. More impenetrable than doors made from wood, fiberglass or aluminum, steel doors with standard stainless steel latches are better able to protect against unwanted entry, fire, noise, vandalism and contamination from exterior elements, providing reliable security and peace-of-mind. Steel is a resilient material manufactured to protect against extreme weather conditions and harsh usage environments. Unlike doors made from other materials, steel roll-up doors can endure the wear and tear of heavy traffic usage and can be outfitted with rust-resistant components including spring coatings and bottom bars to further extend their longevity. While wood doors are susceptible to warping and rotting, aluminum doors can quickly become dented and fiberglass can easily crack—all of which require replacement—with proper installation and maintenance, metal doors can last 30 years or longer. The high-quality primers and paint coatings used on steel doors protect against chipping and scratching, keeping the doors looking better longer. Steel roll-up doors require little-to-no maintenance and are easily replaceable—making them one of the most reliable, cost-effective options in the industry. ABC’s doors are unique in that they feature gear-driven tensioning brackets that ensure safe and easy adjustments that can be made on site and with minimal down time. Steel roll-up doors are available in a wide variety of sizes, styles and colors. In addition, manufacturing improvements and advances in coating and paint products enables customization to suit even the most unique aesthetic requirements. Because roll-up doors open vertically and are gathered into a roll instead of sliding along tracks, they take up little overhead space while enabling convenient and easy access. The door you need will depend on its intended use. Light-duty doors are manufactured to meet the specific and unique demands of small structures, portable buildings or recreational facilities while heavy-duty doors meet the needs of more demanding environments like commercial freight and utility buildings, warehouses and agricultural facilities. It is vital to consider your geography when selecting steel roll-up doors. If your project is located in a region susceptible to high winds from weather events including hurricanes, tropical storms and tornadoes, a wind-rated door tested in accordance with International Building Codes and that complies with your insurance requirements should be considered. Check both local and national building codes to understand if you need wind-certified doors, which can dramatically reduce maintenance and replacement costs as well as minimize downtime. Be sure that you are familiar with and fully understand the warranty options available on the products purchased. It is common for doors and door components to be covered by a product warranty, while the coil coatings and paint are warranted under a second that should include considerations for film integrity as well as both chalk and fade. To learn about ABC’s roll-up door solutions, visit our Roll-Up Doors product page or contact your local sales representative.